The Gold to Housing ratio is a quite useful measure for evaluating relative values between real estate and gold, and also has an interesting historical track record for identifying turning points in long-term gold price trends. After the presidential election of 2016 and with the continuing strength in housing – it is worthwhile revisiting this basic measure, because the results aren't at all what most people likely think they are. 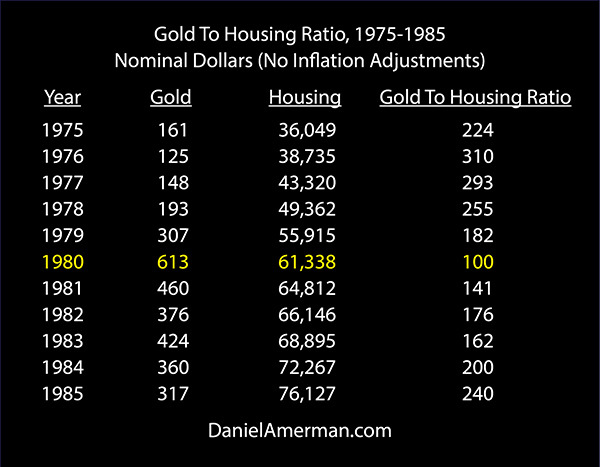 The Gold to Housing ratio is a measure of relative value between gold and real estate. It is the number of ounces of gold required to purchase an average single family home in the United States. Now people often buy gold and real estate as alternative investments, either because they are seeking fundamental diversification from financial assets such as stocks and bonds, or they are concerned about inflation. However, while real estate and gold are each tangible assets and can be powerful inflation hedges – they don't tend to move together in real terms. This can be clearly seen when we adjust historical prices for inflation, as shown above. Both investments do oscillate up and down around long term averages over the 40+ years, but they so in quite different cycles, with their peaks and valleys occurring in different years. When we take the $240,399 median national price for an existing single family home and divide it by the $1,251 we come up with a Gold to Housing ratio of 192, meaning it takes 192 ounces of gold to purchase an average single family home. The housing and gold averages above are based on national averages for each year, including 2016. They are also the most current information available as of the beginning of March of 2017. Housing is reported on a lagged basis, and the December of 2016 prices only recently became available. The closing price for gold as of February 28, 2017 was $1,256, which is within $5 of the 2016 average annual price of $1,251. More information on the specifics are included in the methodology notes linked here, including why it is called the Gold to Housing ratio rather than the Housing/Gold ratio. 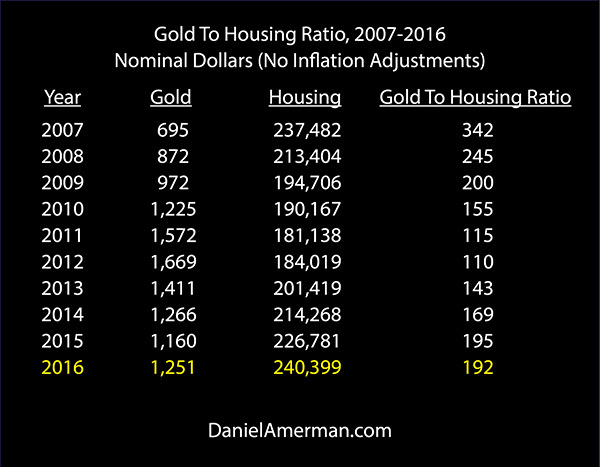 Below is a quick summary of 15 key points about the Gold to Housing ratio in 2016. Background information follows which further explains the ratio and its history. I have been writing about these subjects for some years now, and for long-time readers I specifically point to the investment implications within that body of work. The great majority of the information should still be clearly understandable for a first time or recent reader. 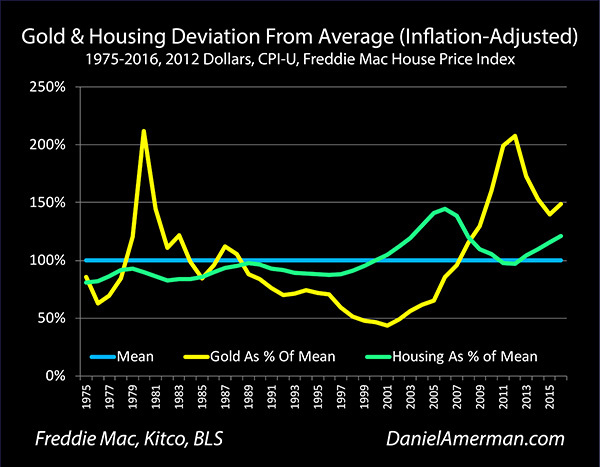 1) Gold and housing are each above their long term averages in inflation-adjusted terms, with gold being much higher relative to its average valuation than we see with housing. 2) The average prices for both gold and housing increased in 2016 by very similar amounts, on a percentage basis. This means there was only a slight change between the 2015 Gold to Housing ratio of 195, and the 2016 ratio of 192 ounces of gold to purchase a home. While the difference is only 3 ounces of gold per house, this did reverse a trend line, and 2016 was the first year since 2012 that gold rose in value faster than housing. 3) Gold is not acting as a "stable store of value", because that is a myth in modern times. Instead gold has been acting as something much rarer and more desirable - which is as a contra-cyclical crisis hedge. This can be clearly seen with the two spikes in value that correspond to crisis and perception of crisis, and led to gold valuations in inflation-adjusted terms that were more than four times as high as the lowest annual average. However, this can be problematic for buy and hold strategies at current price levels, when people think they are buying a stable store of value, particularly when inflation taxes are taken into account as analyzed here. 4) As an inflation hedge, and as explored in the Crisis Strategy as well as Gold Out Of The Box, gold is behaving exactly as expected, and experiencing asset inflation in inflation-adjusted terms as market expectations of crisis are rising, which unlocks far more upside potential than would exist if gold were a mere stable store of value. If full blown crisis does develop, then gold still has substantial upside potential, even with its high current valuation by historical standards. Indeed, in nominal terms (non inflation-adjusted) there is still room for a spectacular upside for gold in the event of monetary crisis. 5) Real estate is not at a peak when inflation is taken into account, but on a national basis, U.S. single family home prices are at the highest levels they have ever been outside of the bubble of the 2000s. 6) In the event of crisis, real estate is quite overvalued, and would likely experience substantial deflation in inflation-adjusted terms as explored in the Crisis Strategy, even though the nominal prices of single family homes may set new records. 7) In the event of crisis and over the short term, gold should strongly outperform housing. 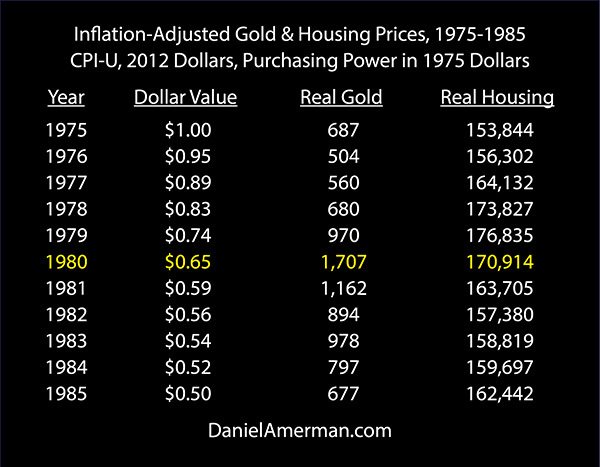 However, from a long term perspective - gold is highly overvalued relative to real estate. A return to the long-term average of the gold/housing ratio of 282 from the current level of 192 would mean that housing would rise in value relative to gold by about 47%. This could occur by housing increasing in value faster than gold does, or by gold falling in value, or by gold falling in value faster than housing does. What the ratio measures is relative valuation. 8) If there is no crisis, then gold should experience steep losses over time in inflation-adjusted terms. In this case, gold may drop below well below its long-term average inflation-adjusted valuation, much like it did for almost the entire period between 1984 and 1997. 9) Quartile analysis is a useful tool for examining the current gold/housing ratio of 192. 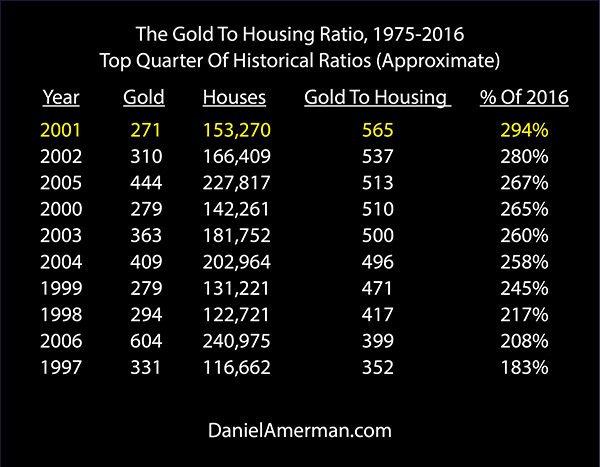 The top quarter (approximate) is that there are ten years in which the gold/housing ratio was between 183% and 294% of the 192 we are currently seeing. In other words, roughly 25% of the time, houses were worth somewhere around two and three times as much more compared to gold, than what we are currently seeing. 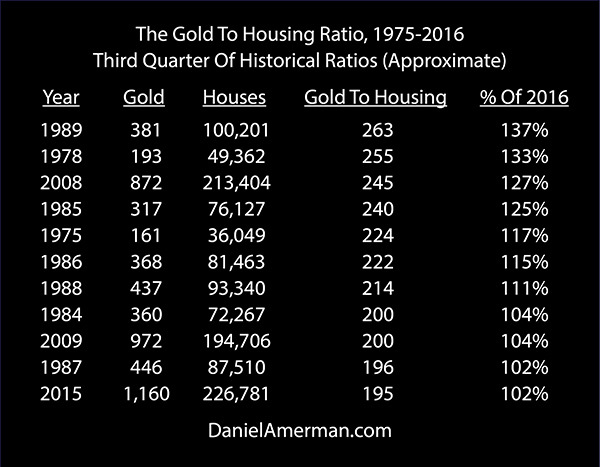 10) There are two quarters (or about 50% of the instances) where housing had a value (relative to gold) in an amount between 102% and 178% of the current ratio. So roughly speaking, about half of the time houses are worth somewhere between a little more and almost twice as much as they are right now, relative to gold. 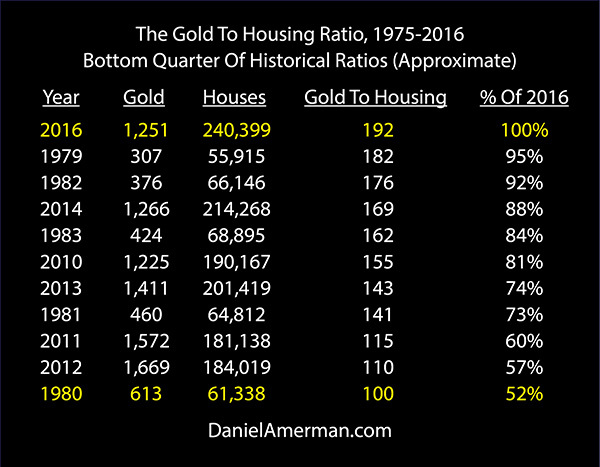 11) In the 41 years prior to 2016, from 1975-2015 (inclusive), there were only ten years where the average gold/housing ratio was lower than the 192 we are currently seeing. 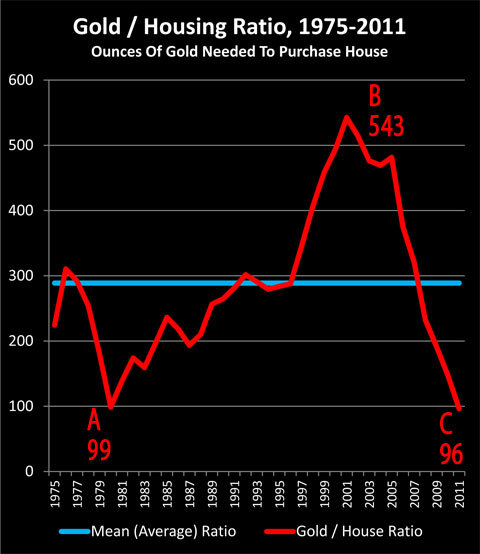 So, in very approximate and rounded terms and based on the preceding 41 years, about 25% of the time gold would be expected to increase in value by between 0% and 100% relative to housing, roughly 50% of the time housing would gain between 0% and 100% relative to gold, and roughly 25% of the time housing would double or more in value relative to gold. 12) The quarters are far from random, but are tightly correlated with crisis and the expectations of crisis - or the lack thereof. All of the bottom quarter, where gold is richly priced relative to housing, are years close to crisis, or years where there were widespread expectations of crisis. 13) Without exception, as we get away from the years immediately surrounding crisis and widespread expectations of crisis, housing has a higher valuation relative to gold than what we are seeing today. The future may travel a different path than the past, but what history seems to indicate is that whether a crisis occurs or not, it is highly likely over the long term that housing will outperform gold, so long we eventually return to post crisis pricing for both tangible asset classes. 14) If there is no crisis, and if liabilities are used with real estate, then such alternative strategies as the Prosperity Strategy or the Stagnation Strategy may outperform gold by many times over. 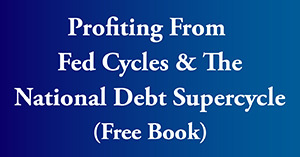 15) Blended strategies such as the Crisis Strategy or the Robust Strategy would likely strongly outperform a pure precious metals strategy if there is no crisis, while still being positioned to profit from crisis if that does turn out to be what happens. If there is a monetary crisis, and if a liability has been used as part of an asset/liability management strategy, then over the long term and after the crisis has receded, income properties on a national average should outperform gold by much more than 47%, and perhaps a multiple thereof. This is only true, however, if the strategy can survive a crisis environment that would likely destroy many traditional real estate leverage strategies. History shows that if you can buy gold "cheap" while real estate is relatively "expensive", then on an asset price basis over the long term, gold is likely to strongly outperform real estate as an investment, all else being equal. Conversely, when real estate is "cheap" and gold is "expensive" relative to its long-term averages, then it is real estate that is likely to powerfully outperform gold as an investment over the long term. But what exactly is "cheap" and what is "expensive"? Answering that question is where the Gold to Housing ratio is quite useful. As there is no dollar component in the ratio itself, inflation index and measurement concerns drop out, and we are left with the value of two of the most popular tangible investments relative to each other. The long-term average is represented by the blue line in the above graphic. Over the 40+ years that gold has been a legal investment in the modern United States, it has taken an average of 282 ounces of gold to purchase an average single family home, meaning the current price of 192 ounces is equal to 68% of the long term average. There have been three major turning points in the valuation relationship between gold and real estate over those years. The first turning point occurred at the peak of financial crisis in 1980, when it took only 100 ounces of gold to buy a house (on an annual average basis). Real estate was remarkably cheap relative to gold – and real estate investments would outperform gold by a huge margin over the next 21 years to come. The second turning point occurred in 2001, with the Gold to Housing ratio reaching a high of 565 ounces of gold being needed to buy a single family home. Gold was remarkably cheap relative to real estate – and it was then gold asset prices that would outperform real estate asset prices by a huge margin over the next 11 years. On an annual average basis, the third turning point occurred in 2012, when 110 ounces of gold was enough to purchase an average single family home. Real estate was once again remarkably cheap when compared to gold, and real estate has powerfully outperformed gold in the years since that time. 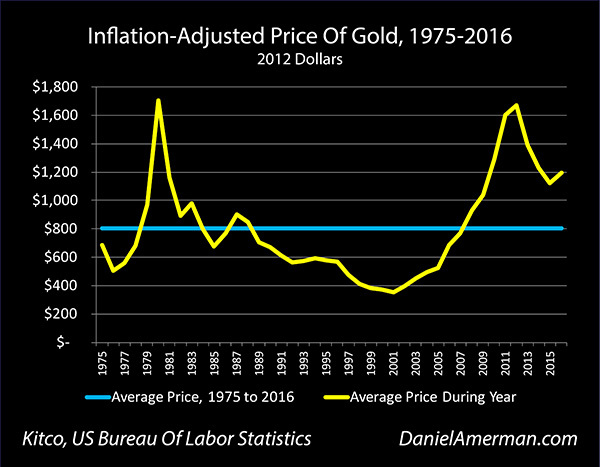 This next graph shows the average annual price of gold in inflation-adjusted (CPI-U) terms between when investing in gold bullion was legalized in the United States on December 31, 1974, and 2016. The blue line is the average price of gold over that period, which is $805 in 2012 dollars. The yellow line is the average annual price of gold during each year. It is worthwhile to consider the situation in 1980. Inflation was soaring. Unemployment was high. An economic "malaise" gripped the nation, and pessimism about the future of the United States economy was rampant. The stock market was moving between flat and down. The real estate market was in terrible shape. The one glittering exception was gold, which was soaring upwards in a spectacular bull market and reaching unprecedented levels – and which many people believed would only be a beginning point, as the dollar continued to fall and the economy continued to worsen. However, from that point forward – gold did not perform or meet expectations. In nominal dollar terms – not adjusting for inflation – the average price of gold fell from $613 in 1980 to $271 in 2001, for a loss of 56%. What is worse is that although the popular theory was that gold would be the perfect inflation hedge, in practice over the long term, gold failed spectacularly as an inflation hedge – at least from the perspective of gold purchased in the three peak years of 1979-1981. The inflation didn't stop after 1980 – indeed, the official rate of inflation in 1981 was 10.5%, the third highest rate of the modern era in the US – but gold investors still lost 32% in that first year after the peak in inflation-adjusted terms. Gold gave up all of its gains relative to its long term modern average of $805 per ounce by 1984, just four years after its peak. 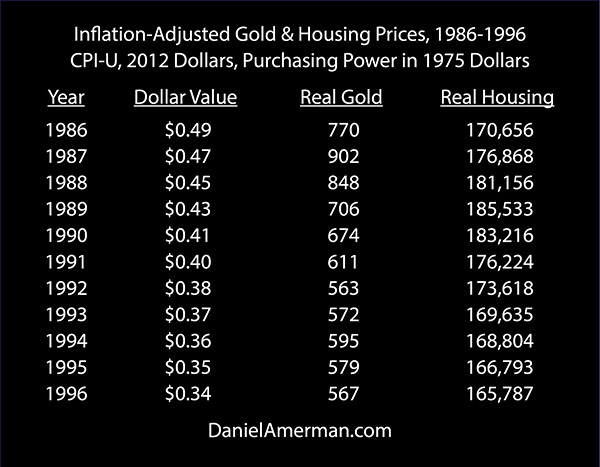 Between 1980 and 2001, the time of the next Gold to Housing inflection point, the dollar would lose half of its value to inflation. Gold did not keep up, however, collapsing from $1,707 down to $351 per ounce (2012 dollars) over 21 years as it lost 80% of its value in inflation-adjusted terms. 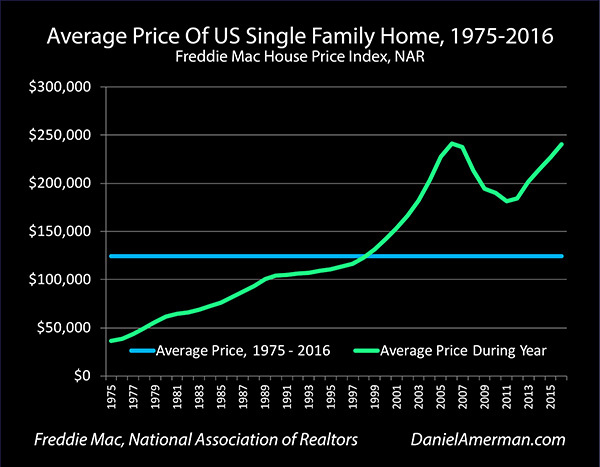 The graph above shows the average price of a single family home in the United States between 1975 and 2016. The trend is strongly upwards, and when viewed from this common perspective, home prices have reached a new long-term peak in 2016. Indeed, it is easy to see why some are concerned that we have experienced a return to bubble pricing, because current prices are so far above most historical prices. The problem is that the picture that is commonly presented for the long-term is completely inaccurate as an indicator of changes in real value (something gold and stock returns as commonly presented also share). 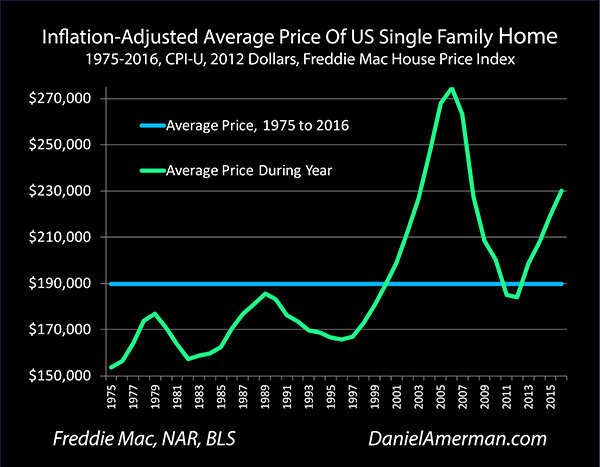 For what is primarily illustrated is not changes in real estate values – but the declining purchasing power of the dollar, as what cost $1 in 1975 costs $4.57 today, if we accept the Consumer Price Index as being an accurate inflation measure. When we adjust housing prices for the 78% decline in the purchasing power of the US dollar between 1975 and 2016, then we get the quite different graphic below. This shows the average price of a single family home in inflation-adjusted (CPI-U) terms from 1975 through 2016, with a mean (average) price of $189,940 in 2012 dollars. In the mind of the general public in 1980, real estate was a total "dog" of an investment and had been so for years. To the extent that some people were turning down promotions if they involved a move, because the raise associated with the promotion often wasn't high enough to offset the radically higher mortgage payments. Many people who would have ordinarily bought homes were renting instead, fearful of how much lower the value might be when they tried to sell. The combination of recession, high unemployment and inflation-induced high interest rates had created a moribund real estate market, with low sales and greatly reduced new home construction. These highly negative market conditions created a pricing situation in which real estate was only being valued at 35% of its long-term average value relative to gold, meaning real estate was extremely "cheap" in comparison – and ready to move the other way. Indeed, from this base of near universal disdain came a remarkably healthy and sustained long-term environment for building wealth via buying investment real estate. Using single family homes as a proxy (investment real estate overlaps, but is not the same thing), the average price for a single family home in the United States rose every year for the next 21 years from $61,338 to $153,270 (no inflation adjustment). This 150% increase took place by 2001, and therefore did not include any benefit from the housing bubble. If we take the long term perspective of real estate investments generating steady performance, where cash flows increase every year as rental payments coming in steadily rise relative to mortgage payments going out, even as equity increases every year as overall property prices steadily rise while the mortgage slowly falls – then the years between the turning points of 1980 and 2001 were a wonderful time to be a long term real estate investor. 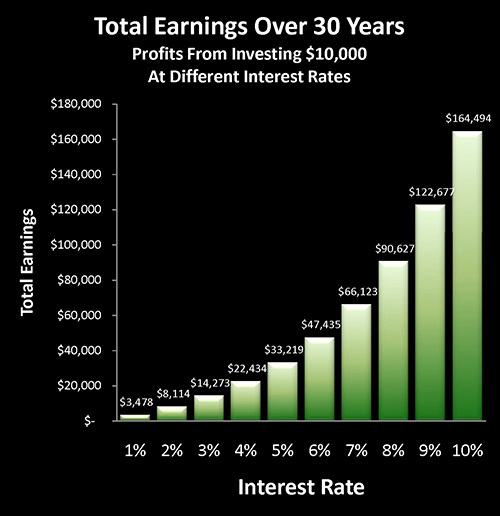 Sure, there were dips and rises and crises as happens with almost any investment category over the long term, but the years between 1980 and 2001 were a great time to accumulate wealth as a long-term real estate investor. 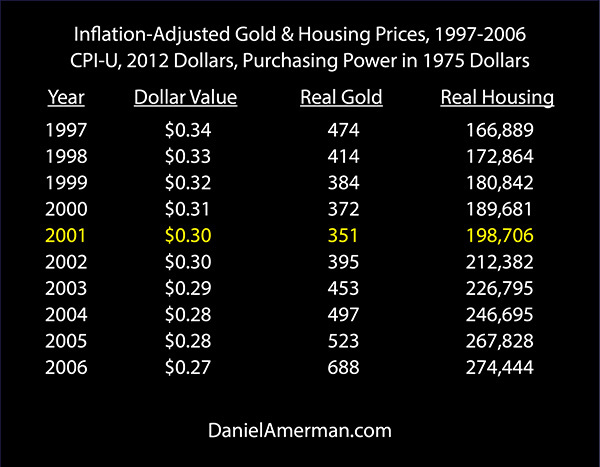 Referring back to the relationships underlying the Gold to Housing ratio, as each inflation hedge separately moved up and down around their long term averages, and as gold soared above its average while real estate fell (in inflation-adjusted terms), making it very cheap compared to gold – then we would expect real estate to radically outperform gold after that time. And indeed that is exactly what happened – in the 21 years following (1980-2001), real estate asset prices outperformed gold by 465%. By 2001, the relationship between gold and real estate had entirely reversed, as the Gold to Housing ratio reached a historic high of 565 ounces of gold to buy an average home. Gold was a total dog of an investment. Real estate was hot. The overwhelming market sentiment, and what most financially savvy people believed, was that real estate was a far superior investment to gold. It was precisely this overwhelming consensus of opinion among intelligent, knowledgeable investors, and some of the most respected financial experts in the nation, which created the situation where real estate was very "expensive" relative to gold. In contrast, if we take the long term perspective of relative value, with real estate far above its historic average value relative to gold (it took 565 ounces to buy a house in 2001), one would expect gold to then powerfully outperform housing. And that is exactly what happened over the following eleven years, from 2001 to 2012. Over those next eleven years, gold would rise from $271 an ounce to $1,669 an ounce (annual average for 2012), even while real estate rose from $153,270 to $184,019 for an average single family home. Adjusting for inflation, gold rose from $351 an ounce to $1,669, while housing fell from $198,706 to $184,019. This serves as yet another confirmation of the central premise of the Gold to Housing ratio, which is that if you can buy an inflation hedge "cheap", then over the long term you are likely to widely outperform an inflation hedge bought "expensive" – given that both gold and real estate move up and down around long-term average values. There is another fascinating feature about the Gold to Housing ratio outliers, when measured on the basis of annual averages. 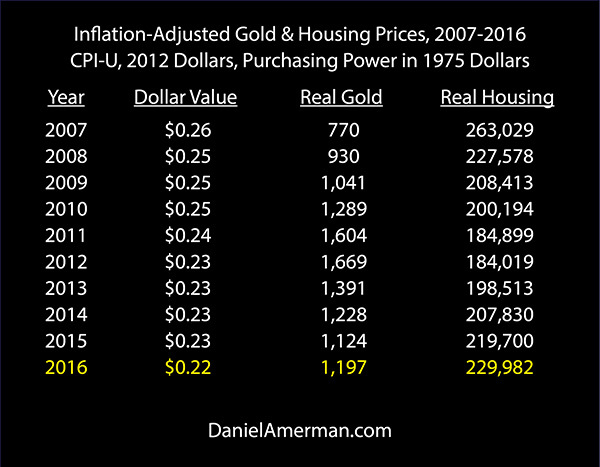 1) The peak price for gold in inflation-adjusted terms in the modern era occurred in 1980 at $1,707 an ounce (2012 dollars), That same year, the Gold to Housing ratio bottomed out at 100 ounces to buy a house. 2) The lowest price for gold in inflation-adjusted terms in the modern era occurred in 2001, when gold fell to $351 an ounce (2012 dollars). That same year, the Gold to Housing ratio peaked out at 565 ounces to buy a house. 3) The second peak and the second highest price for gold in inflation-adjusted terms in the modern era occurred in 2012 at $1,669 an ounce (annual average, 2012 dollars). 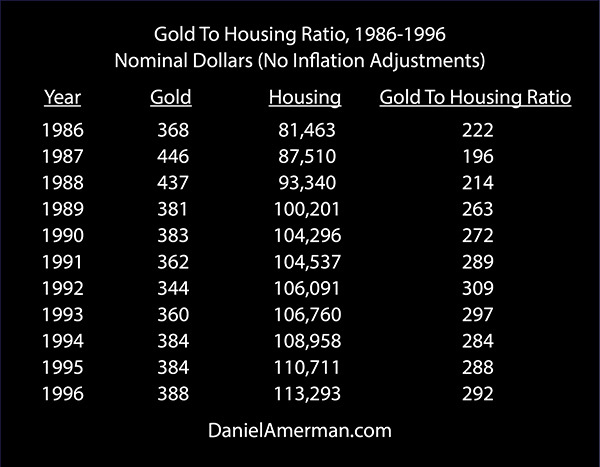 That same year, the Gold to Housing ratio again bottomed out at 110 ounces to buy a house. In all three instances, there was a 100% correlation when we look at the peak and bottom values for gold in inflation-adjusted dollar terms, and the peak and bottom values when we view gold in real estate terms. Another way to view this is that while looking at gold in inflation-adjusted terms is very useful for identifying extreme valuations that may mark a turning point in the market, it is limited by the accuracy of the inflation measures. So if the official measures for three years were 2%, 1.5% and 2.5% – but that did not correspond to our personal experience – then what was the real rate of inflation for each of these years? If we can't come up with an actual inflation number for each year that we believe to be accurate, then determining whether gold is undervalued or overvalued becomes problematic over a multiyear or multi-decade period, because we can't trust our data. The advantage to the Gold to Housing ratio is that because the value of one tangible asset is being measured in terms of another tangible asset, the dollars drop out of the equation – and so do any concerns about the accuracy of the inflation measure. It is also worth noting that the Gold to Housing ratio works differently in the other direction. That is, it did not call the peak in the real estate bubble – far from it. Instead, this ratio of relative values said that real estate was starting to get historically expensive compared to alternative investments right at the very time that the bubble was just starting to make an appearance. So the information value of the ratio was not to provide market timing for speculative trading within a bubble – but rather was a signal to long-term investors that a bubble was beginning. Since that third turning point at the beginning of 2012, these have been difficult years to be a gold investor – and rewarding years to be a real estate investor. Gold had been pummeled so badly, particularly as part of the commodities rout of the 2015 & early 2016, that it seems irrationally low in price to many. On the other hand, real estate has been climbing for years now, and there are fears from some that it may even be entering another bubble phase. Now, investors generally seek to buy low and to sell high. For most that means buying popular investments, and trying to follow the trend line in the hopes that already rising prices will rise still higher. The goal is to be a particularly astute member of the "herd" in other words, and to benefit from the movements of the many. For contrarian investors on the other hand, seeking to buy low and sell high can mean the opposite. They may seek to invest in unpopular markets that have been driven to irrational lows. They may opt to get out of or even short markets that have been driven to irrational highs. In other words they seek to move the opposite direction of the "herd", in order to directly benefit from the return of rational pricing. While each can enjoy their successes, there are also issues with both schools of investment thought. For example, markets usually look their very best – right before they crash. So a mainstream price trend follower who chases popular investments right along with everyone else – risks getting caught in a series of price bubbles, and suffering losses with each correction or bubble popping. On the other hand, there is a well known saying that "markets can remain irrational for longer than any one investor can remain solvent", and financial history is full of examples that support that statement. So for a contrarian – if prices in a given market are irrational for perhaps multiple years, but they do eventually collapse – being eventually proven right does not protect one from potentially significant financial setbacks in the interim. Now usually the distinction between a trend-follower and a contrarian is reasonably clear cut. In simplified form, a trend-follower would definitively buy real estate over gold, as real estate is popular and prices are rising, while gold is less unpopular and prices are still lower than they were during the peak years of 2011 to 2013. Whereas a contrarian might do the opposite, believing there to be a strong case at this point to move out of overpriced real estate and into underpriced gold, and the sooner the better. But how can the contrarian be sure about underpriced or overpriced? This is exactly where more long-term measures can be the most useful. As a truth-test on feelings, emotions, pervasive market psychology – and more generally, what we want to be true versus what is true. 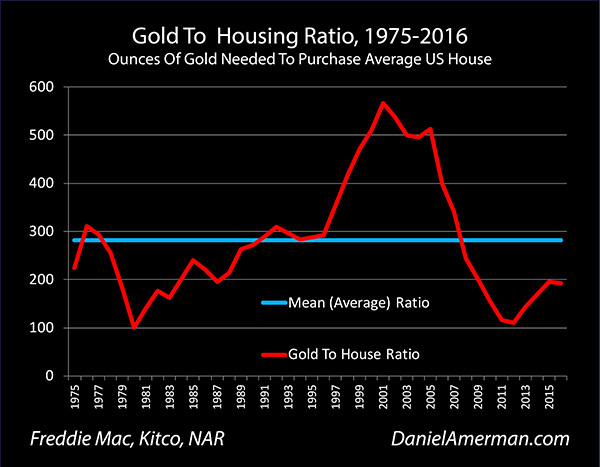 The truth test is that the long-term average for the Gold/Housing ratio is 282 ounces to buy a house, and the current ratio is 192 ounces to buy a house. On a long term average basis, if we take the current average single family price of $240,399 and divided by 282, we get a value for gold of $852 per troy ounce. This would indicate that at a price of $1,251 per ounce, gold is overvalued by 47% relative to average single family residence prices in the United States. Yes, until recently, gold had fallen for years. Yes, real estate has been steadily climbing. But the issue is that the starting point for both of these assets was a gross distortion of the normal value relationship, when the Gold to Housing ratio dropped below 100 ounces to buy an average house in late 2011 (on a monthly basis, not annual). And yes, the ratio is up more than 75% since then – but it needs to almost triple before historical averages are achieved. Indeed, real estate is in the unusual place right now where both short-term trend followers and contrarians holding a long-term investment perspective might identify it as being a buy. For those who are drawn to rising prices – we are four years into a trend line of rising prices. For those seeking value pricing, and to buy in at prices below the long-term averages – real estate is still quite attractively priced relative to gold. And what allows these two usually-opposing strategies to co-exist together is that the starting point was such a gross distortion compared to long-term averages. Because the gap was so great, that means that even after prices have traveled a considerable distance, there is still a lot more ground to travel before an average pricing relationship is reached. Now, the qualifications and caveats are of course myriad, as they often are. Real estate is the supremely local investment, and valuations in some local markets may indeed be reaching the irrational stage again, when we look at affordability measures. Which is precisely why this analysis uses the Freddie Mac index rather than the more publicized Case-Schiller measure – so that all fifty states are included, rather than only the 20 largest urban areas. When we include Indiana and Wisconsin along with New York City and Boston, as well as Alabama and Kentucky along with Dallas and DC, and Nebraska and Idaho along with San Jose and Los Angeles – then based upon long-term averages, single family homes across the United States are still on average substantially undervalued relative to gold. Now, financial system risk and rapid currency devaluation could certainly create extraordinary profits for precious metals. Once we get away from the outliers, then any predictive power over the short and medium term can be poor, as the ratio can indeed just wander around in the middle for years on end. And the 42-year average of 282 ounces per home is far from being a stable destination, but rather it is just a number that can be passed quite quickly on the path from undervalued to overvalued, and vice versa. But once we understand the limitations, and don't try to use this ratio for more than it can deliver – that is when we can use it to our advantage. Whether one wants to think of housing being undervalued relative to gold, or gold being overvalued relative to housing, either way – that is clearly the current situation, and it is not even close on a national basis when compared to long-term averages. This means that all else being equal, over a long enough period, an investment in housing will more likely than not outperform an investment in gold – possibly by a substantial margin – assuming that each investment tends to revert to the mean (i.e. return to average valuations) over time in the future, even as they have in the past. And in a long-term strategy which employs both investments, then unless one is specifically investing for financial crisis, there is a case for putting an over-weight on housing, and an under-weight on gold, given current relative price levels. The graph below shows the Gold to Housing ratio for the modern era in the United States, from when gold investment was legalized on December 31, 1974 through November of 2011. 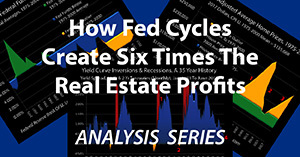 When analyzed at that time (link here), the ratio clearly showed an historic outlier was being reached in terms of gold being expensive relative to real estate. To place this in perspective, late 2011 was a time when "everyone knew" gold was a great investment that had been performing spectacularly for years, climbing to over $1,900 an ounce – while at the same time "everyone knew" real estate was a lousy investment that had been falling in value for years with no bottom in sight. But yet, the overwhelming consensus at that time notwithstanding, history would indeed have its own way, and within months the relationship would powerfully reverse in a way that has persisted to this day. The information provided by the Gold to Housing ratio in 2016 is not as extreme an outlier as it was in 2011, but it is nonetheless compelling – and may be surprising. Indeed, this long-term measure flat-out contradicts many widely held perceptions about market valuations today. 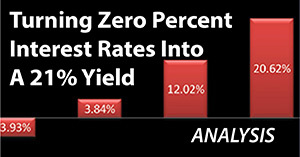 The year 2011 was a stellar year for the gold bull market, and a low point for the real estate market. This was a time when many people felt absolutely confident as to which was the good investment versus the bad investment – indeed, the market consensus was overwhelming. Yet, out of the vast sea of commentaries about gold and real estate in 2011 – many are ludicrously out of date in 2016. Now if a measure is to have genuine validity over the long-term, rather than just being a reflection of the market psychology of the moment, let me suggest that it needs to not be ludicrously out of date five years later. The quoted text below is the word-for-word closing to my 2011 analysis (only the underlines have been added in 2017, for emphasis of on key sections). "In my opinion, the best way to reconcile these two sides of contrarian investing - to bring together the need to buy low and sell high, while also meeting the need for liquid safety - is to say "both". The relative amount of assets devoted to each of these contrarian investments then depends on the individual investor's personal assessment of the likelihood of actual financial meltdown." Judge for yourself – does that conclusion stand the test of time of the last five years? 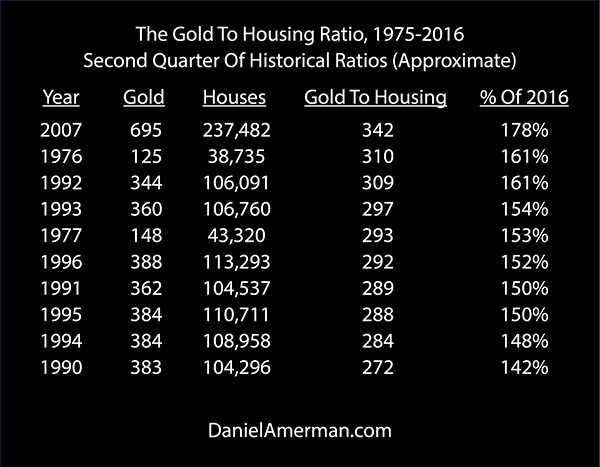 And if so, might an understanding of the implications of the Gold to Housing ratio provide meaningful insights (once appropriately adjusted for the current ratio and conditions) for the years and decades ahead? What you have just read is an "eye-opener" about one aspect of the often hidden redistributions of wealth that go on all around us, every day. 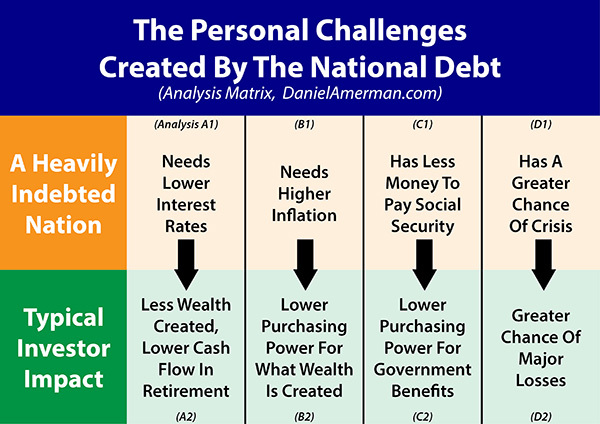 The U.S. national debt is likely to change our daily lives in multiple ways over the coming decades, some of which are little understood by savers and investors. 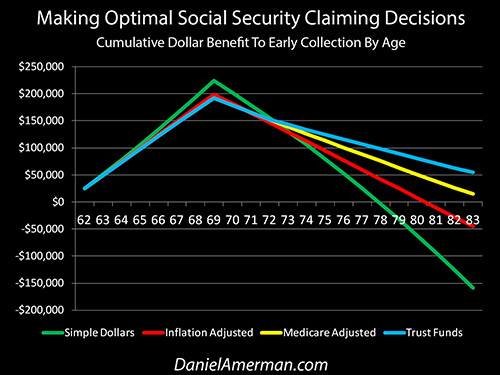 As shown in the first row of analyses in the matrix which is linked here, heavily indebted nations have major challenges when it comes to interest rates, inflation, financial stability and the ability to make Social Security and Medicare payments in full. 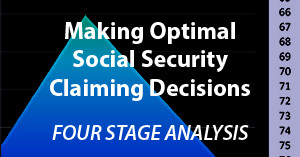 As is examined in the second row of analyses, each of those national challenges can directly translate to life-changing personal challenges as well.